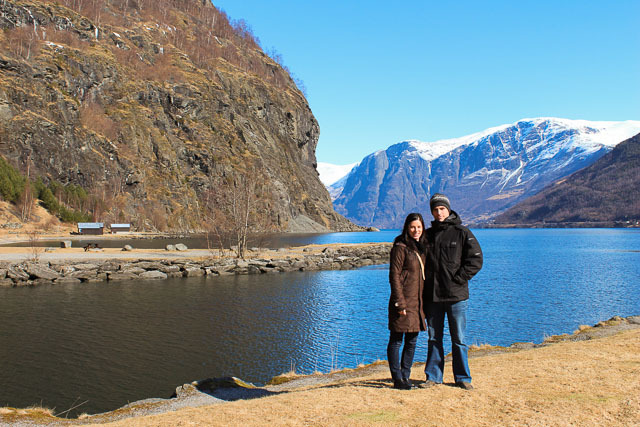 After completing the first half of our Norway in a Nutshell tour, we stopped off for the night in Flåm. 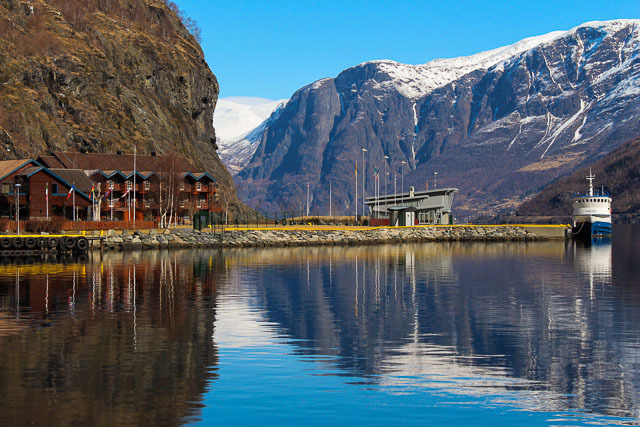 The tiny village of Flåm is found at the end of the Aurlandsfjord which is one of the legs of the Sognefjord, the world's largest fjord at 212 kilometres. 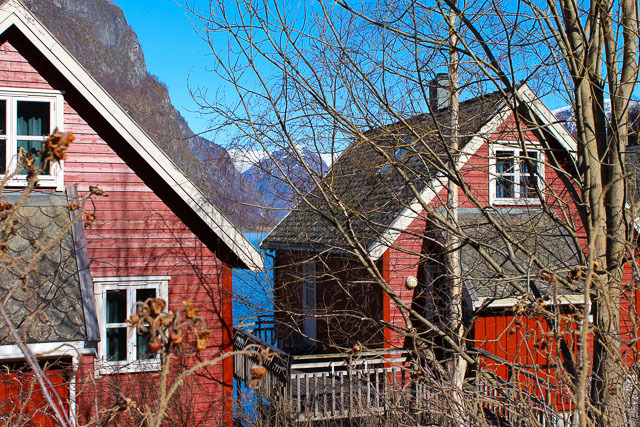 It sits amongst the sea and the mountains and is quintessentially Norwegian beauty. 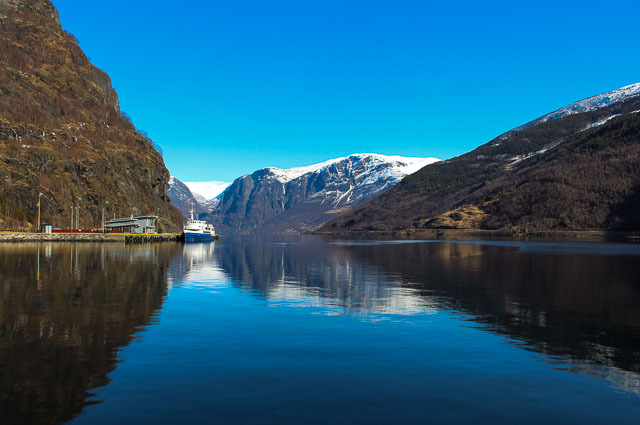 At the end of the 19th century, German and English tourists came to know Flåm as a stop on their Norwegian fjord cruise and the village continues to woo visitors from all over the world. There isn't a whole lot there - a few hotels, a few cabins, a railway museum, a couple of cafés and tourist shops & a brewery. From the town, one can plan a number of excursions or hikes to pass their time there but we chose just to sit back and enjoy the scenery with a beer in hand. We stayed at the Flåmsbrygga Hotel. The rooms were basic but comfortable and every single one had a gorgeous view and a balcony. The three of us spent the majority of our time parked in the sun, with a beer in hand breathing in that fresh mountain air. That evening we wandered next door for a Norwegian Easter buffet followed by live music & beer at the local brewery, Ægir. It was a quiet 24 hours in Flåm but I liked it that way. When the high season kicks into gear, the cruise ships start pulling in and while I hear it's quite the sight to see those enormous floating buildings pull up to this tiny village, I liked that we sort of had it to ourselves. Gorgeous! Your photos of Norway are just stunning! It's pretty easy to take a good photo here - the landscapes are stunning! Ahh, beautiful! Can't wait to go there someday. And that water is just so perfectly reflective! I can't get over it. I'll be back in the summer with my parents so I'm sure I'll see it full of tourists as well! what a lovely little trip! Oh wow it's soooo gorgeous! So beautiful. I think I'd prefer it nice and quiet too. sounds like the perfect place to disconnect and relax! say, when does it get 'warm' or even slightly warm in norway? Your photos turned our perfectly Jay! I agree, it was nice to have the place to ourselves. I'll be interested to see what it looks like when you take your upcoming summer trip there. When we moved here after a couple of years in Gabon, we sort of felt like we were coming home. It does remind us a lot of Canada. Funny enough, many East Coasters tell us that it looks just like Nova Scotia & Newfoundland... something to do with the colourful wooden houses and the maritime feel.